Zhang Yin, who became a household name Wednesday morning for topping a recent list of China's richest people, is a billion yuan wealthier by the afternoon. Reports of her massive wealth were printed in morning newspapers yesterday and before markets closed that afternoon, share prices of Zhang's Guangdong-based Nine Dragons Paper Industries Co., Ltd. jumped 2.77 percent, adding an extra 1.1 billion yuan (139 million U.S. dollars) to her assets. Zhang, the 49-year-old founder and chairwoman of the paper company, was reported to be the mainland's richest person with a fortune of 27 billion yuan (3.4 billion U.S. dollars). "Zhang Yin's personal assets must have increased by 1.1 billion yuan," Thursday's Xinmin Evening News quoted a company official as saying. 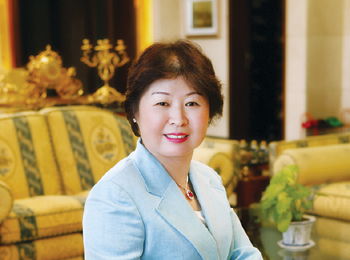 Zhang is believed to be the wealthiest self-made woman in the world. According to Rupert Hoogewerf, who set up the Huran Report in 1999 which lists wealthy people in China. She is richer than the U.S. television host Oprah Winfrey and author of the Harry Potter series JK Rowling. However, her low profile has helped her remain largely unknown over the past years. Zhang made her first appearance on the list of richest people on the Huran Report in 2003, ranking 17th with 2.5 billion yuan. In 2005 Forbes's China Rich list, listed Zhang as 107th richest with 1.5 billion yuan, according to the Xinmin Evening News. The newspaper said Zhang's lawyer sent Rupert Hoogewerf a letter in 2003, saying that she didn't want her name on the list. Born in a soldier's family in northeast China's Heilongjiang Province, Zhang was the eldest sister to seven children. She went to Hong Kong in 1985 and started her career in waste paper trading with 30,000 yuan. Zhang defied financial hardships, cheating business partners and intimidation from local mafia to build up her wealth in the subsequent five years before moving to the United States with her husband in February 1990 to pursue her dream of becoming the "empress of waste paper".